This collection parodied some attitudes towards ‘Art’. The ‘Diogenes Con Show’ displayed 35 studies of ‘Diogenes’ all of which were titled: This study took 27 minutes, This study took 43 minutes etc. From early portrayals of St Jerome to today’s Father Christmas Cards, the be-whiskered, harmless philosopher-rogue has always been a money-spinner. Even Rembrandt painted such images for Russian and European collectors as a sure income. ‘Diogenes’ was a well-known tramp who lived in a barrel at Chelson meadow. 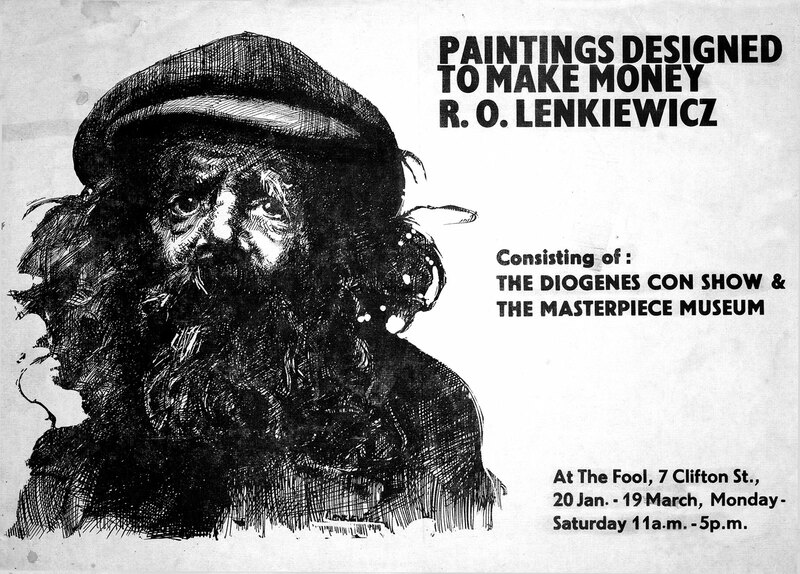 Lenkiewicz wrote that one clear distinction between the ‘image’ of ‘Diogenes’/philosopher-rogue and ‘Diogenes’/Edwin Mackenzie in the real world, is that the ‘image’ of him is far more acceptable in the average household, than the man himself. Ethics and aesthetics was an issue again. The centrepiece of 'The Masterpiece Museum' was the painting Plymouth Mourning Over its Unfortunates, an allegory of the social effects of alcohol. Ironically, Lenkiewicz's journal records that the painting went unsold but passed into the care of one of the artist's patrons who then sold it on the artist's behalf through a gallery "without my agreement" and that it was "now in Australia". NOTE Amusing or not, the present exhibition is a joke. It is hoped that those who profess an interest will take the trouble to read the leaflets that accompany the collection. 1. The Red Chair* £500 * This has been submitted to the Royal Academy. The gallery has experimented with a small display of the work of a now forgotten painter. Please take leaflet to the left of the entrance. This complex work conceals a large amount of allegorical symbol; suffice it to say that what is known of it’s underlying meaning covers the following associations: THE SEVEN SLEEPERS OF EPHESUS: THE STUDIO, BY GUSTAVE COURBET: SOCIAL ART AT IT’S WORST: THE MYTHOLOGY OF SLEEP, etc. Some attention should be drawn towards the manuscript cabinet which contains a few very rare examples of the painter’s numberless sketch-books. We are grateful to the Plymouth Archives for the loan of these items. The remainder were unfortunately stolen from the museum by an irresponsible art student some years ago. An added attraction is the collection of miscellaneous pieces in the tall cabinet near the entrance. Of special interest is the article on ‘The Uses of Bad Art’ by Geoffrey Grigson. It is said that the painter died with this paper clutched to his heart. This blue scrap was underlined and on the floor; it would not be over-imaginative to speculate that this indeed was the intended ‘last word’ of our hero. Robert Lenkiewicz - Born 1942 - Attended Saint Martin’s School of Art in London and the Royal Academy. His Grandfather had been Court Painter to Ludwig of Bavaria, and although Lenkiewicz shrugs off this distinguished ancestor as an average painter, he presumably inherited something of his skill. Lenkiewicz is responsible for painting the now famous Barbican Mural in Plymouth. This massive work covers 3,000 sq. ft. and is in the Elizabethan period, with complex reference to alchemy, Mysticism and Metaphysical thought.